Leadership in Louisville’s Kingdom! | don't bite the apple…work is not a fairy tale! 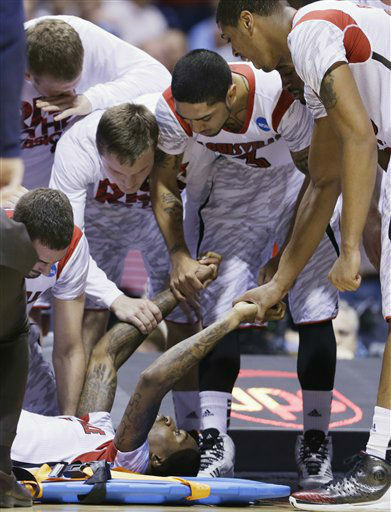 In the Kingdom of Louisville, Kevin Ware is King. What words did you have after seeing that replay over and over? I had planned on writing about the Cinderella Teams and was cheering for FGCU- a 15th seed making it to the Sweet Sixteen was an amazing feat. But this year, a number one seed will be the Cinderella team. Louisville making the Final Four after seeing their teammate suffer a horrific injury in front of their bench? Theirs will be the story of the comeback! Kevin Ware scored an average of 4.5 points a game, a middle of the pack player for this number-one seed team. But in the most gruesome moment of his career during the first half of Louisville’s Sweet Sixteen game against Duke, he proved to be an incredible leader. We’ve all seen the pictures. As his teammates fell to the floor, covered their eyes and rallied to his side, he focused on calming his team down. Before being wheeled off the court, he asked the coach to gather the team. Teammate Peyton Siva said “He told us to go out and win this game.” Peyton was amazed by his courage and after the win wore Ware’s jersey to celebrate. Ware is from Atlanta where the Final Four will be played. Coach Pitino wiped his eyes as his player was taken away. He had to rally his troops to finish the game. His words over and over to his players were “Get him back home”. It worked, and Louisville recovered. After three minutes without scoring, they went on to win 85 to 63. So how do you come from behind at work? Everyone on this team forgot about themselves and dug deep and fought for the victory. Ware sacrificed his comfort and hid his pain to motivate his team. His teammates set aside their fears to bring home the win. And their coach had to juggle all those feelings and keep them in the game for a little while longer. If you want to come from behind at work, focus on the team. What are you doing to make the team better? Do you often say “It’s not my job”? In this economy, the best companies work as a team, and the “it’s not my job” mentality doesn’t fit. We are all doing more than our share. It’s so much better than sitting at home reading the want ads. See what you can do to get the team ahead and don’t ask for PTO or other rewards- just do it. When managers can count on you and know you are looking out for the greater good, they rally around both you and the team. Would Kevin Ware have been a celebrated player without the injury? Probably not. But no one will ever forget his generosity of motivation or the image of the team surrounding him before leaving the court. Be selfless in your Kingdom and people will notice! I will be watching and cheering the Number One Seed Cinderella Team on Saturday…Go Louisville! This entry was posted in Motivation and tagged Cinderella, Final Four, human resources, Kevin Ware, leadership, Louisville, Peyton Siva, Rick Pitino, working relationships. Bookmark the permalink. 3 Responses to Leadership in Louisville’s Kingdom! Pingback: Rise to the Occasion! | don't bite the apple…work is not a fairy tale! Glad I’ve finally found soenihtmg I agree with!